from a meal gone by. Seriously, last week I got, 3 requests for Tiramisu. Seems several Konfidentially Kosher readers were at a wedding in Chicago where this decadent creamy dessert was served and served and all of them wanted to know how to make a version at home. Originating from Italy its name literally means, “pick me up.” That describes tiramisu perfectly. You want to pick it up and shove it in your mouth as quickly as you can. The combination of coffee and sugar is addicting and it’s very easy to create a simple version of the elaborate bakery version. Most recipes call for ladyfingers and while kosher certified ones are available they are pricey. I have substituted pound cake, biscotti, sponge cake, vanilla cookies, or angel food cake. When I’m making a lower calorie version (HAHAHAHA) I trade in the mascarpone cheese for skim milk ricotta. 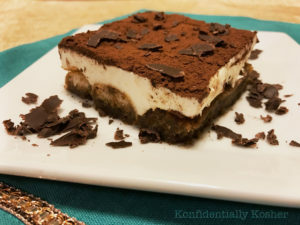 In my opinion, Tiramisu tastes better when the flavors have a chance to blend overnight. Tiramisu can be prepared in advance and kept in the freezer. It needs to be served COLD so just remember to remove it from the freezer so it has enough time to thaw but not get to room temperature. In a medium bowl of an electric mixer combine the yolks, sugar and vanilla. Beat until smooth and light yellow, 3 to 5 minutes. By hand, fold in the mascarpone and orange zest until combined then set the mixture aside. Dip the ladyfingers or cake slices lightly into the coffee and then arrange 12 to 14 of them in the bottom of a 9×9 inch dish. Spread half the mascarpone mixture over the ladyfingers. Sprinkle the chocolate chips over the top Repeat with remaining ladyfingers and finish with the remaining mascarpone mixture. Sprinkle the remaining chips on top. Cover and refrigerate for at least 2 hours or overnight. To serve sprinkle a little cocoa powder over the top. Serves 6 to 8. Coat a 10 X 15 glass baking dish with nonstick spray and set it aside. In a bowl combine the cocoa powder and sugar, mix to combine. Fold in the whipped cream and then set aside. In the bowl of an electric mixer combine the softened cream cheese and sugar. Beat until smooth and creamy. Add the milk, vanilla and whisky. Beat on low until combined and then on high until fluffy. Transfer the mixture to another bowl and set it aside. In a small bowl combine the instant coffee liquid with the whisky. Mix and set aside. In a bowl combine the strawberries, whiskey and 2 tablespoons sugar. Mix and set aside. In a bowl combine the egg yolks, and mascarpone and beat until smooth and set it aside. In yet another bowl whip the egg whites until bubbly but not stiff, at that point add the sugar and continue beating until it creates stiff peaks.